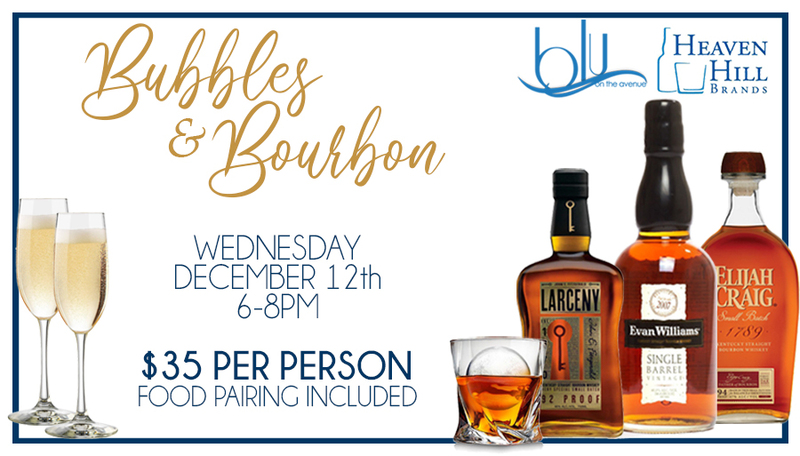 Bubbles and Bourbon Tasting Event! blu on the avenue and Heaven Hill Brands have teamed up to bring you an incredible tasting event! Learn how to make new cocktails for your holiday events! We will have four stations set up to teach you how to make either a bourbon or champagne craft cocktail. While you are enjoying your drink, you will have the opportunity to try an appetizer that pairs perfectly with the cocktail creation. We will also be selling baskets designed to help you recreate these craft cocktails at home; complete with glasses and the alcohol used through the night!